We discovered the other day that we were pretty much out of pork so Fred decided to butcher a hog. It was cut and packaged yesterday and is now mostly saved in the freezer. In a few days we will be smoking the hams and bacon. 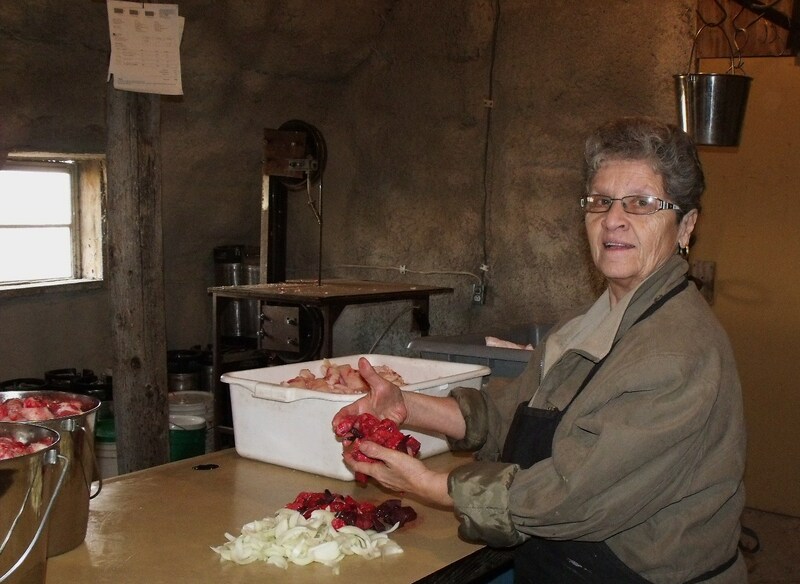 Nonna wanted to make Italian sausage so we phoned my Aunt Lillia back in Rockville, Md for the recipe. It was pretty easy and tasted exactly like it did when we used to buy it at Ehrlich’s Market back in East Stroudsburg, PA. Basically, we put fresh ground pepper and plain old salt into the ground pork sausage. No seeds of any kind were added!! 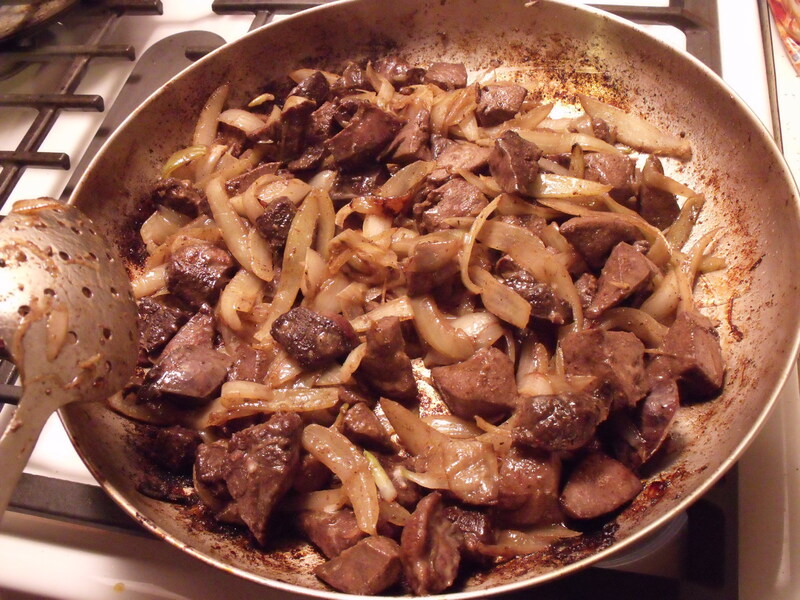 The salt amount used was a teaspoon per pound and the black pepper added was 13 tsp. for 15 pounds of meat. We cooked some on the wood stove to make sure of the right amounts of seasoning and it was very delicious, so we went ahead and stuffed the links. Fred cleaned the intestines very well and soaked them in salt and he wished he would have saved more because we ran out. We only had a couple of pounds left over and I just packaged them up to mix with the venison to make meatballs. A favorite fast food around here are the ready-made sausage patties and we made 15 pounds of these. 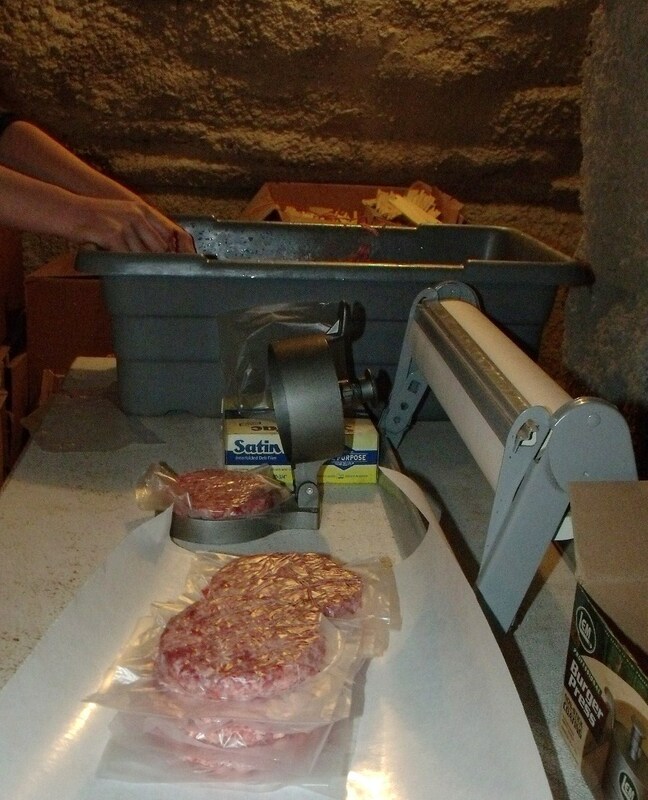 They are very easy to make with a small press and the plastic sheets that go in between the patties. These we did not season because, depending on whether they are eaten for breakfast or as a burger, the seasoning will change. 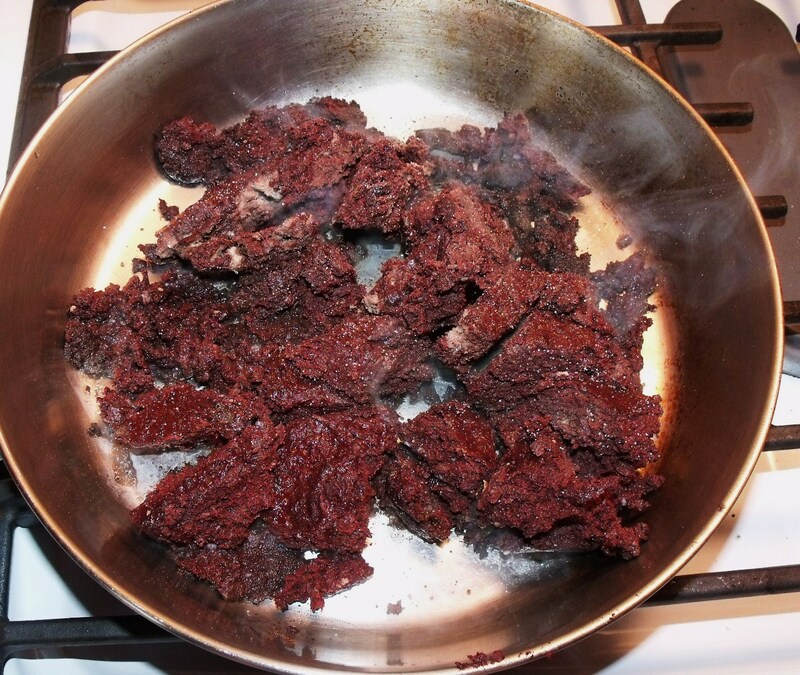 We also made Blood Sausage which is another dish that you either like or dislike. The recipe we used is the one that Fred’s grandfather used at the Haas Bakery many years ago. 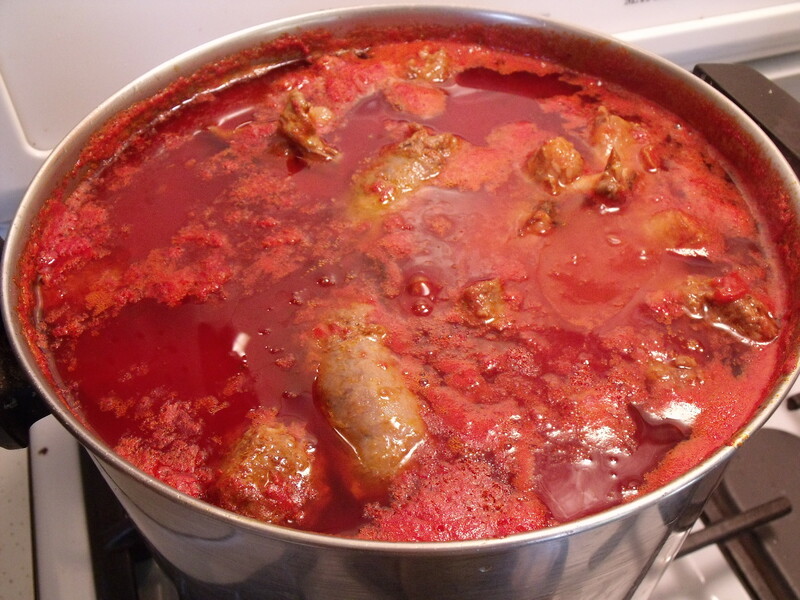 There wasn’t enough blood to make a large batch so I cut the recipe down in half. 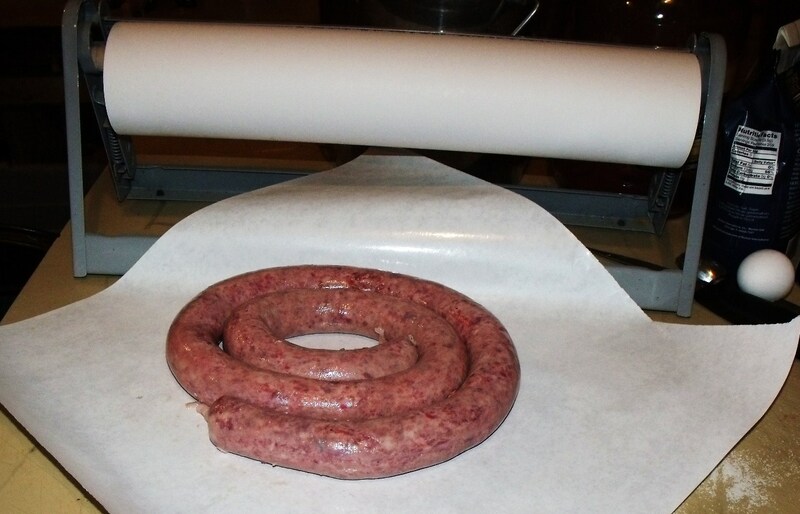 It was nice making the entire mess out in the butcher shop and only doing the baking of the sausage in my kitchen. The kids decided that next time we are going to stuff them into links, like they do at Hyvee Store in Marshall. Yesterday though, we baked them in baking pans as we have always done in the past. While I was in the middle of packaging, labeling and freezing the meat, I received a phone call from a very nice lady named Debbie. She wanted to order some of our honey. Not knowing where she was from, I suggested it was less expensive if she wanted to pick up her order on our farm. It was then that she surprised me by saying she was from California and that she had just read about our family in the National Catholic Register. I checked it out and sure enough, our Callens Family was mentioned, just as she had stated. Here is the link if you would like to read the page. Thanks, Tim Drake, for your very kind words; it was very sweet of you to mention us! Music is beautiful and good and has been a big part of our lives. We are tied to the farm and land. We have deliberately kept most of our performances fairly local (under 4 hours away) in order to sustain the farm life that we believe is so valuable to our family and spiritual life. God bless the talented Catholic performers out there, who have kept their strong faith, sense of modesty and morality, even while performing and competing in the secular world. Sadly, that is not an easy thing to do these days. Keep making music for the Glory of God and realize that talents are a real gift from Him. Thanking God now for family life, the freezers that are full of meat, veggies and fresh homemade butter, barns full of hay, a years worth of wood to heat our home, the refrigerator full of raw milk and our own cheese, pails of our own honey, the new batch of Honey Beer brewing in the basement, the hams and bacon curing out in the butcher shop, all from His green earth. The list goes on, but I am thinking along the farming and food line here tonight. May God bless you and your family during this beautiful Advent season. 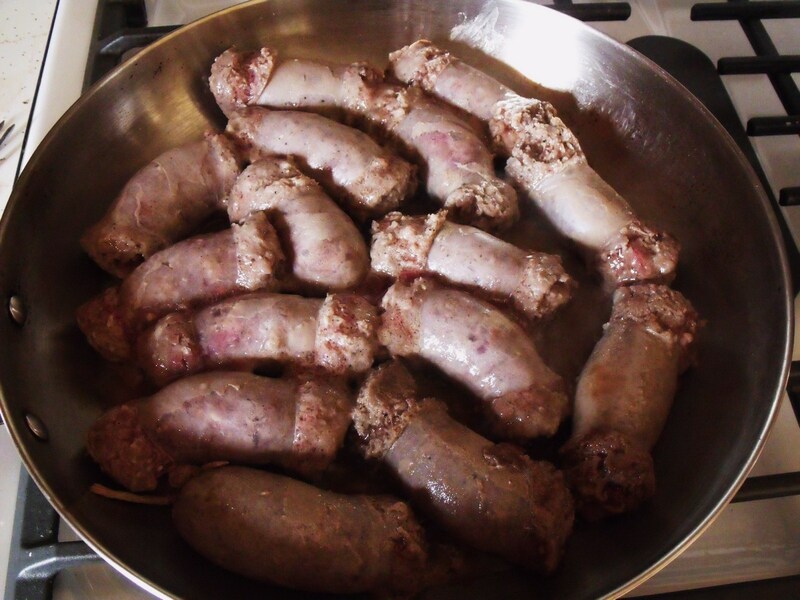 This entry was posted in FARM KITCHEN and tagged Blood sausage, Callens Family, east stroudsburg pa, Hog butchering, Italian Sausage, sausage patties. Bookmark the permalink. As I recall Angela, you guys thought there were beef!!! of the way they feel in your mouth. Not much flavor either. God bless and wishing you a very Merry Christmas! That sounds delicious! It’s fun making things that are a family tradition……and trying new things that will become traditions in the years to come. That’s exactly how it happens here, out of pork, butcher a hog, out of beef, the same etc. 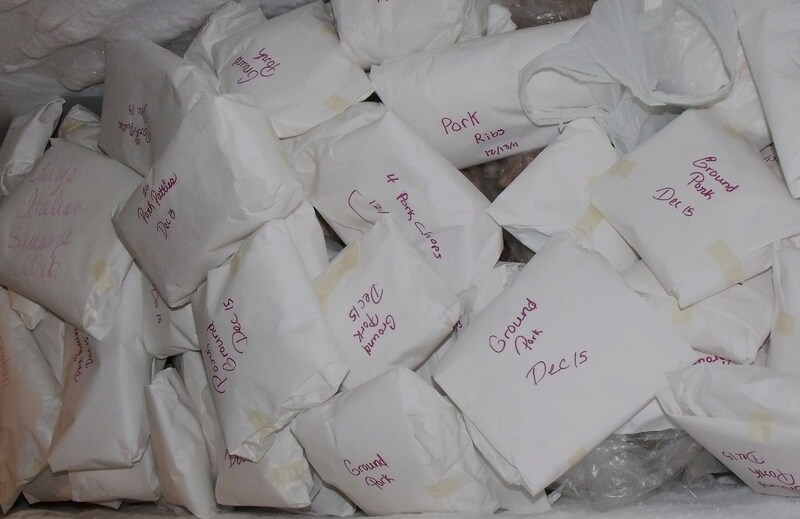 We are pretty much out of beef so looks like as soon as I make some room in the freezer, that will get done as well. Hope you had a lovely Christmas Karla; God bless your family. Wow! Incredible…I’ll be looking for a good size pork roast to cook up for our traditional New Year’s Day dinner. (Jimmy’s side of the family!) You guys never cease to amaze me! Merry Christmas and a Happy New Year. I suppose you are counting down? I am feeling down…………just thinking of Thursday and the departure. Have a great New Years Anet. Hope you had a great Christmas as well.